I finally made it out to the Souhegan River today for the first time this spring. The Milford gauge read 57.0 ˚F, which got me excited. My first stop was a local stocking site in Milford where I've had luck before. I managed only one take over there, a small brown which got off after a very brief battle. I saw it come up for my indicator twice until I changed the angle of my drift and leader length. By the time it took, the indicator was close to me, resulting in a weak hook set. The spot must have been cleaned out since all other likely holding areas did not produce any further action for me. I quickly changed pace and headed upstream along Route 31 in Wilton. This area has many pullouts and is characterized by long stretches of riffles, runs, pockets, and pools. I stopped by one such pullout ahead of the DHZ (delayed harvest zone). I fished a small stretch near the pullout and I was just about to leave until I saw a nice pocket slightly deeper than the surrounding riffles. Bingo! I hooked and landed a nice little brown on a san juan worm. Before I continued fishing, I decided to pause and take in the scenery. I continued fishing this spot for about an hour or so, working downstream to some nice holding water but I couldn't stir anything else so I decided to head to the lower DHZ before heading home. I started off fishing pocket water downstream of the Route 31 bridge with the same results and headed up to the large run below the bridge with the same results. I worked my way upstream to an area where I had luck last year. I found a likely looking pocket and spent some time working it. When I hit the perfect seam, I had a bow come up and hit my indicator. Frustrating, but definitely a change from getting nothing. I worked the seam hard, added weight, and switched my dropper for a large soft hackle and finally, I broke the silence with another brown! I think with the high water, these fish are actively keyed in to large flies or anything flashy to get their attention. I worked that seam even harder to try and tempt another fish but no takers. I worked upstream to some more nice pocket water but turned around after I took a dip trying to cross the stream. It wasn't the greatest day I've had but it wasn't terrible considering the fantastic views punctuated by the occasional fish. I have found your blog and am really enjoying it so thanks! 'Cats-87 here with a daughter who has just finished her first year in Durham. 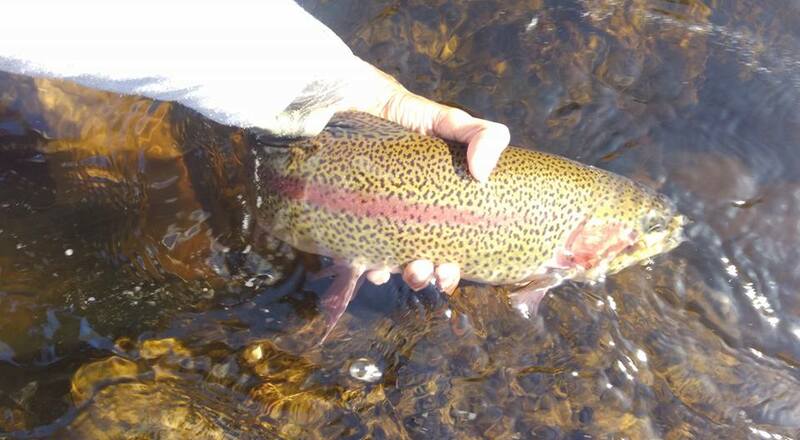 I do enjoy fishing the Souhegan but find more days are like what you have described above. It is amazing scenery and the couple of takes or near misses keep me going back.